There is no better way to experience all-wheel driving with torque vectoring than on ice and snow. Andreas Holl, Director Controls and AWD Development at Opel, talks about personal heureka moments and the perfect playing field for trying out the new system at the Winter driver training. There is no reason to dread snow and ice, because at the Opel Winter Training everyone can learn everything they need to know about driving on slippery surfaces – while also having a great time in beautiful Austria. The training vehicles are the Opel Mokka X, the Opel Insignia and the brand-new Insignia Country Tourer in various trim and powertrain variants. Two of four sessions in January 2018 are already fully booked, but there are still spaces on January 26 and 27. Participation costs €1,199 per person. Opel employees get a discount of -10%. The price includes the theoretical and practical driver training sessions as well as the overnight stay in the four-star hotel including meals, but excludes travel to and from the venue. Reserve your spot here. Decisions can be made rather rationally after a long process of weighing up pro’s and con’s. Or in a snow-covered hairpin turn in Lappland. Andreas Holl, Director Controls and AWD Development at Opel, steers a test vehicle with twinster all-wheel drive and with lots of speed into a bend in the middle of nowhere in North Sweden. 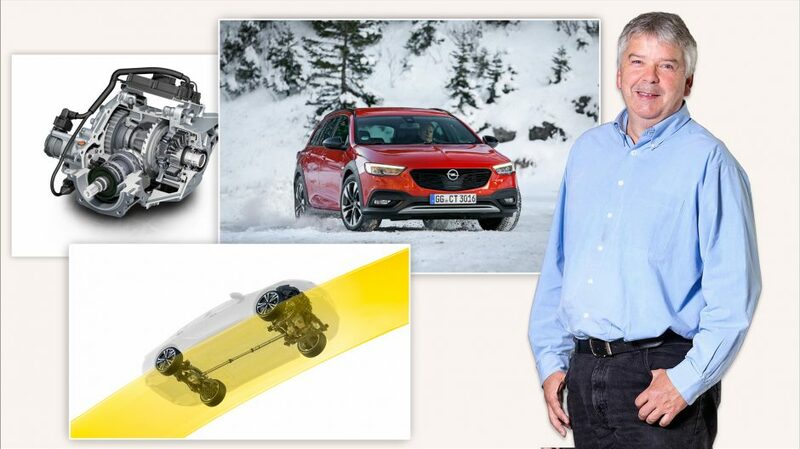 He is fascinated: “The extremely well bend stability and directional stability, even under these extreme driving conditions, just knock me over.” All of this happened three years ago – when Opel’s most modern all-wheel drive with torque vectoring came into being. A technique that offers a plus in terms of driving fun and safety – thanks to its perfectly regulated torque for each rear wheel. This performance is powered by pure high-tech. A twin clutch system on the rear drive module replaces a conventional differential in the Twinster drivetrain with torque vectoring. “As a result, the system can apply torque to one or both of the rear wheels individually,” explained Holl. Thanks to this technology, the Insignia turns in with more precision, offers optimum cornering grip and impresses with exemplary traction even in winter conditions. In general, higher torque is sent to the outside rear wheel, stabilising the vehicle. To avoid overestimating one’s own driving abilities, the all-wheel drive expert also recommends deactivating the system connected to the ESP anti-wheel slip for test purposes during the training. “The before-and-after comparison is dramatic. If you had everything under control up until then, without technical support your drive will be over at the second pylon.” The Twinster all-wheel drive system provides constant increased active safety. “We are very happy that our newest all-wheel drive can be experienced under extreme conditions during our winter training,” said Jörg Schrott, Director Opel Motorsport. The flagship is the first high-volume model ever that can be ordered with this optional system. The Winter Training programme includes optimum vehicle control on snow and ice with exercises such as a slalom course, braking, load-alteration manoeuvres and drifting on an oval track. “Every participant will be elevated to the next level of their driving ability during the training with professional instructors,” added Jörg Schrott. A nice side-effect: “It is pure driving fun!” In addition to a Mokka mountain adventure tour, a challenge and a co-pilot ride in the Opel ADAM R2 rally car are part of the programme.